The list of popes begins with St. Peter and continues through the present day. The pope is the head of the Catholic Church. Peter was called the Bishop of Rome. All others who became Bishop of Rome were also recognized as popes. The list sometimes says interregnum. This is Latin for "between reigns". It means there was no pope. 3 September 590 to 12 March 604 Gregory I, O.S.B. 25 August 608 to 8 May 615 Boniface IV, O.S.B. January 847 to 17 July 855 Leo IV, O.S.B. 22 April 1073 to 25 May 1085 Gregory VII, O.S.B. 24 May 1086 to 16 September 1087 Victor III, O.S.B. 12 March 1088 to 29 July 1099 Urban II, O.S.B. 15 February 1145 to 8 July 1153 Eugene III, O.Cist. 1 September 1271 to 10 January 1276 Gregory X, O.Cist. 21 January 1276 to 22 June 1276 Innocent V, O.P. 5 July 1294 to 13 December 1294 Celestine V, O.S.B. 22 October 1303 to 7 July 1304 Benedict XI, O.P. 28 September 1362 to 19 December 1370 Urban V, O.S.B. 7 January 1566 to 1 May 1572 Pius V, O.P. Emblem of the Holy See. ↑ 1.0 1.1 1.2 "List of Popes," Catholic Encyclopedia (2009); see Nihil Obstat. June 1, 1911. Remy Lafort, S.T.D., Censor. Imprimatur. +John Cardinal Farley, Archbishop of New York; retrieved 2013-4-8. ↑ 2.0 2.1 "St. Peter, Prince of the Apostles," Catholic Encyclopedia; retrieved 2013-3-18. John N.D. Kelly, The Oxford Dictionary of Popes, Oxford University Press, 1986. AA.VV., Enciclopedia dei Papi, Istituto dell'Enciclopedia italiana, 2000. 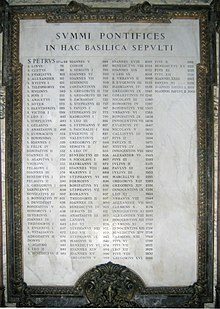 Pontificia Amministrazione della Patriarcale Basilica di San Paolo, I Papi. Venti secoli di storia, Libreria Editrice Vaticana, 2002. This page was last changed on 26 August 2018, at 09:44.